The package UPS brought me today...no doubt what's inside! I almost hugged the UPS guy today. Over the weekend, J ordered a pizza from Giordano’s for a co-worker and picked up a couple for us as well. I love Giordano’s pizza. 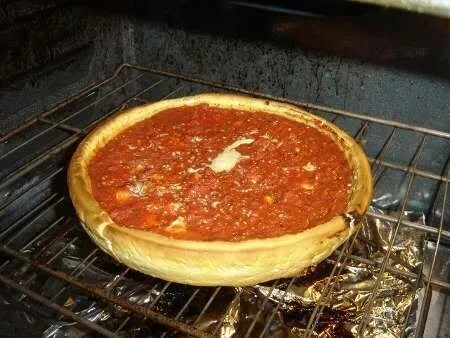 When I think of Chicago pizza, this is what I think of. To the untrained taste buds, Giordano’s is no different from The Pizza House in East Lansing or Ann Arbor, but in reality, there’s a difference. Oh, not much, but just enough. We were starting to wonder if the pizzas were coming today. I had planned dinner around them getting here. I had to run to the dry cleaners, but I kept procrastinating so I didn’t miss the delivery. I sat down to play Guitar Hero figuring I’d play one gig then go pick up my dry cleaning. I got halfway through my second song when the door buzzer rang. YAY! The pizzas made it. I pulled the cheese pizza out of the Styrofoam box then went off to run my errands. J was going to be home around 6:30 tonight for dinner and the pizzas take about 20 minutes to cook. I didn’t leave here until ten minutes to six, so by the time I got home, I knew it was going to be close to get the pizza done in time. When I got home at ten after six, I opened the package and saw the oven needed to be preheated. Damn. Didn’t count on that. Anyway, I preheated the oven to 450 and started working on salads to go with our pizza. As J was walking in the door at about six forty, the timer was going off and I pulled the pizza out. The first bite was a little rough. Since I didn’t thaw the pizza before cooking it, the inside wasn’t totally done. I had to put it back in, but I had already cut it so I had to use a cookie sheet. That sure helped things cook. Five minutes later, the cheese was oozing out and we had a hot pizza. The second first bite was heavenly. There’s always a big debate about Chicago style pizza…even in Chicago. Some people prefer Lou Malnati’s. Others prefer Gino’s East. On the south side, most people don’t even want deep dish. South siders tend to prefer thin crust pizza. Myself, I prefer Giordano’s. I like Malnati’s and thin crust is really starting to grow on me, but I love Giordano’s. 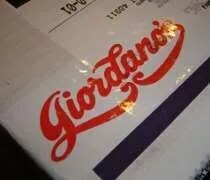 When I think of Chicago pizza, I think of Giordano’s. My co-worker ate his for breakfast today- he was so excited he could’t wait… he says his turned out just as good. Most Chicago style sauce are cold sauces. It’s not cooked before it’s put on the pizza. That’s why pizza from Chicago tastes so different than other places. A more traditional marinara is cooked down to a thicker sauce then put on the pizza. Chicago sauces are not. They’re put on raw. 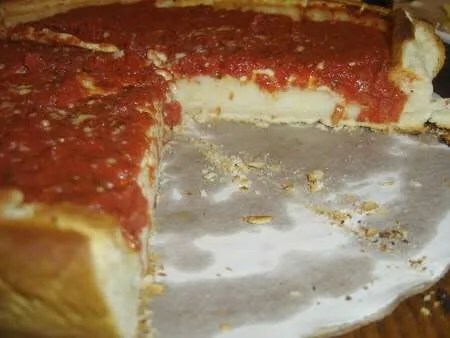 I have a recipe somewhere for a Lou Malnati’s knockoff, but I’ve never seen one for Giordano’s.